Seasons Steaks, Pork, and Hamburgers. Make into a marinade too. Grill Mates® Montreal Steak Seasoning comes from a place of narrow alleyways and cobblestone streets lined with artists, jewelry makers, street performers, fruit and flower stands. The place is Old Montreal. Where centuries-old fieldstone homes and hotels live on as quaint bistros and fine restaurants. And where, one day, thick steaks were served with a rousing new combination of seasonings that quickly became a huge favorite with steak lovers from near and far. 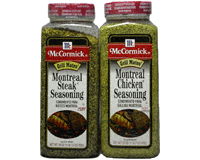 McCormick Montreal Steak Seasoning, without any added MSG, is a robust blend of gourmet spices and seasonings that captures the bold, savory flavor of steaks served in Old Montreal. 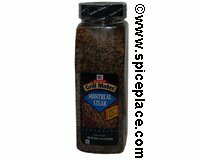 Shake or rub 1 tablespoon Grill Mates Montreal Steak Seasoning onto 1 pound steaks, pork chops and hamburgers before grilling or broiling. For a zesty marinade: add 2 teaspoons Montreal Steak Seasoning to 1/4 cup olive oil and 2 tablespoons soy sauce. Add meat; marinate 45 minutes. 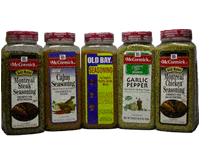 Packaged in flavor sealed bulk container with dual flip top lid for shaking or measuring. Ingredients: Salt, Spices(Including Black Pepper and Red Pepper), Garlic, Partially Hydrogenated Soybean Oil, Natural Flavor and Extracts Of Paprika. Allergy Information: Contains Soy. 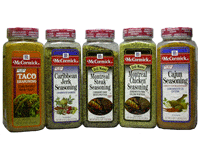 Grill Mates and Montreal Steak are registered trademarks of McCormick & Co., Inc.